Title O Brother Where Art Thou? On IMDB O Brother Where Art Thou? Outline Amara unleashes her full power in her search for God, while Dean attempts to understand the connection they have. Sam, Crowley, and Rowena devise a plan to communicate with Lucifer in Hell. A preacher is spreading his teachings to a group of followers in a park. Amara joins the crowd and challenges the preacher before turning a nearby fountain to blood and commanding lightning bolts to strike everyone in the park, in an attempt to get God's attention. Sam’s visions of Lucifer grow stronger each time he prays to God, and convince him that he should seek Lucifer’s help. Dean continues to object but eventually concedes it may be their only option, leading the Winchesters to meet with Crowley. Dean argues for his help, saying that if the Darkness manages to unleash her full power then nobody is safe, including Crowley. Sam reminds Crowley he had had several chances to stop her before she was grown but didn't. Crowley retorts that Amara insisted on sparing Dean, and demands to know what connection there is between the two. Dean avoids answering directly but reveals that the Darkness is God’s sister. Crowley finally admits that there might be a way for Sam to meet Lucifer, but they will need a secure site that can neutralize Lucifer’s power. To do this they will need spell work from the Book of the Damned, which is currently in Rowena's possession. On the other side of town, Amara continues her search for God in a church, and asks a priest how she can meet God. He explains that no person has met God, and that she can talk to Him through prayers. Not satisfied by the priest's answers, Amara consumes the souls from everyone in the church and slaughters them. Back in Crowley's Lair, his demons bring him the captured Rowena. After a short bickering over who hates the other more, Dean and Sam come and explain the situation -- the four of them need to work together to lock away the Darkness that was unleashed when the Mark of Cain was removed. Rowena demands her safety after doing her part, which Crowley agrees to, until the next time Rowena decides to go after him. A group of angels discuss how they should act against the Darkness, frustrated with the inaction of the powers in Heaven, a nameless angel convinces the others to rally together and to spread the word, get past their differences and stand united against the Darkness. The news that the Darkness is God’s sister also comes as a surprise to Rowena. She asks for Nadya's Codex and Charlie's code breaker so she can read the book, and Sam confirms her that she will be reading only from the pages needed. When Dean tells her that they will need to know how to open the Cage and how to protect Sam once it’s open, Rowena’s curiosity rises. Sam reveals they are seeking to speak to Lucifer. Rowena becomes excited at the prospect. At the Men of Letters Bunker, Sam supervises Rowena while Dean leaves to investigate the deaths at the church in the hope that he may find clues to Amara's whereabouts. As he leaves the church, Sam calls him, but Dean becomes distracted by the sudden appearance of Amara and the call goes unanswered as she teleports Dean to a clearing in a wilderness. Now alone with each other, Amara tells Dean that she was wronged by her brother, God, locked away by His jealousy that she would bring about a better creation than Him. Amara tells Dean how she would change the world, bringing bliss to everyone. When Dean asks what she would do after she takes everything over, she tells him he knows all he needs to for now. Dean turns quickly and plunges a blade into Amara. The blade cannot penetrate her body and shatters, the broken shards falling to the ground, Dean looks stunned. Amara tells him that was pointless, but understands, as he is a warrior and it is his nature to resist. She draws Dean closer, seemingly about to consume his soul, but she kisses him instead. Dean reciprocates, but eventually is able to pull himself away from Amara. When he questions her about what just happened, she tells him that was "the future," and that they’re bonded by the Mark of Cain. Their discussion is cut short by a group of angels, led by the rallying angel from the earlier scene, who say they have come to take her to Heaven. In response, she kills each of them. As the sky cracks in fury and thunder, a look of concern falls on Amara's face and she returns Dean to the park near the church before the full force of Heaven rains down upon Amara in a single unified blow. Back at the Bunker, Rowena says she has found a way for Sam to safely talk to Lucifer. Sam calls Dean, who once again fails to answer, and Rowena insists that must proceed immediately. In Hell Sam follows Rowena and Crowley to "limbo," an area in the furthest reaches of Hell where they will communicate with Lucifer. When they reach the end of the long corridor, they find an empty cage. Rowena works on placing warding sigils and spells on the cage and then summons Lucifer to appear inside it. Lucifer demands of Crowley why he is there. Sam shows himself and Lucifer can’t hide his excitement at seeing him. When Sam asks about the Darkness, even Lucifer admits that that is not good news. Lucifer admits that he had helped God locking up the Darkness and he knew that Sam need him to lock up the Darkness once and for all. He declares he needs a human vessel to do this but Sam flatly refuses. 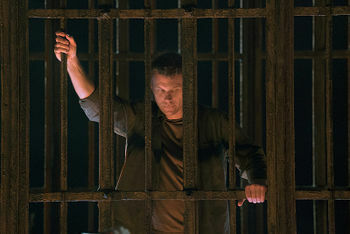 Suddenly, the warding on the cage dissipates and Lucifer is able to trap Sam inside the cage. Lucifer reveals that the visions Sam has been having were actually from him, not God. It was all part of a plan to get Sam back into the cage with him. Sam: You had a shot at taking her out when she was with you, but apparently you thought sucking up was the way to go. Dean: And that didn't work out so well. Crowley: Because she chose you, and you couldn't control your girlfriend! What happened in that room? Why did she insist on sparing you? What is she to you? Dean: You're the king of the joint, don't you have a key? Crowley: It was sealed by God Himself. Of course I don't 'have a key.' The mechanism is of divine manufacture. I believe its secrets, along with the spells for warding Sam, are recorded where many such mysteries are found -- the Book of the Damned. Amara: Do You see what's happening? All Your favorites, all Your chosen, they are suffering. Show Yourself! Sam: You're sitting there with the Book of the Damned, and the means to read every word, and you think I'm gonna set you free. Do I look crazy? Crowley: Makes your flesh crawl, doesn't it, Moose? I get it, I'm the king of this place, still not my cup of tea. Sam: I don't know, Crowley, I'd say it suits you -- dark, empty. Lucifer: Well, that leads me to my next question. Where's the big burrito himself? Where's God in all of this? Sam: All current indications of his presence, are that there are no current indications of his presence. Lucifer: What? Caught the fun bus out of town. Figures. Amara: I see the weariness in your eyes, the mistrust. I don't blame you. Amara: It's incredible, how it endures -- the propaganda. He was so threatened by me, fearful that I would make a more perfect creation than He. So He exiled me, virtually erased me, passed down stories that I was a threat. Lucifer: Well, I did help Dad seal up the Darkness all those years ago. She's quite a force, determined to take over everything, even back then. Prone to tantrums, I can see why Pops is laying low. Amara: The future. The inevitable result of our first meeting, what you've been feeling since that moment. What we both felt, that we're bonded. You're the one who set me free. Dean: No, that was an accident. Amara: It was destiny. You bore the Mark, I am the original Mark. You and I will be together. Dean: No, no that's not gonna happen. Amara: It's so simple Dean, we will become one. Why wouldn't you want that? Lucifer: Together again. Hey, Sam Winchester, miss me? I bet you did. I have to say, you're extraordinarily calm given the circumstances. Sam: It's pretty much exactly how God told me it was going to be. Guess I just have to go with it and play my hand. Lucifer: That would make so much sense, if it was God that was doing the talking. You see Sam, when the Darkness descended, the impact on Hell was massive. The Cage was damaged. Through the fissures I was able to reach out. It wasn't God inside your head, Sam. It was me. So you see, He's not with you. He's never been with you. It was always just me, so I guess I am your only hope. Sam: It's never gonna happen. Lucifer: Ah. Well, settle in there, buddy. Hey, roomie -- upper bunk, lower bunk, or you wanna share? "O Brother, Where Art Thou?" is the title of the 2000 adaptation of Homer's The Odyssey by the Coen Brothers. In Homer's Odyssey, the protagonist Odysseus travels to the underworld to speak with the spirits of the dead in order to find a way out of his predicament of being lost at sea. In the book of Exodus in the Bible, God speaks to Moses through a burning bush. In Season 8, there was a burning bush when Samandriel was tortured by Crowley and Viggo in 8.10 Torn and Frayed. Rowena: You and your bloodthirsty brother say we're partners in this holy war against Amara, and yet... Trussed like a chicken. To be "trussed like a chicken" means to be bound and secured tightly. Sam: I promised Dean I'd call. Rowena: I promised Lincoln a fun night at the theatre, things change. It's now or never. Rowena is referring to Abraham Lincoln who was assassinated in 1865 at Ford's Theatre. The Sigil of Lucifer can briefly be seen in the notes Rowena is studying. Rowena: You may summon Fergus. And tell him to bring a handcart. Rowena: We are going to Hell. Rowena is making a reference to the saying that one is "Going to hell in a handcart" when you undertake something sure to end disastrously. Rowena: Well, dear if you can't stand the heat, get out of Hell. This is a play on the saying "If you can't stand the heat, get out of the kitchen." Lucifer: Sam Winchester, my old roomie. Hug it out? A phrase most popularly used by the character Ari Gold from the HBO series Entourage. Dean: Well, your brother was going all Kanye, blowing his horn. Dean is referring to musician Kanye West, who is never shy about proclaiming his own achievements, such as calling himself "the number one human being in music." Dean: Some people find comfort in that -- Golden Rule, brother's keeper. It is His universe, His rules. The Golden Rule refers to the principle of altruism. While it is the feature of most types of spirituality, it is most often associated with the Abrahmic religions (particularly Christianity) and the idea that people should "Do to others what you want them to do to you." "Brother's keeper" refers to the story of Cain and Abel. In religious lore, after Cain killed Abel and God asked where he was, Cain replied "Am I my brother's keeper?" This is the first episode of season 11 where the Impala does not make an appearance. The previous mass smiting mentioned by Castiel, the destruction of Sodom and Gomorrah, also resulted in the production of Lot's Salt.